This week I was playing around a bit with the combination of the fat-sounding DiMarzio FS-1 (FS in fact stands for ‘fat Strat’) plus a ‘normal’ vintage-sound pickup. I have the DiMarzio in the middle and a MK61 – a reproduction of a 1961 Strat pickup, becoming available exclusively on mk-guitar.com soon – in the bridge position of one of my guitars. For more background information on what this has to do with the early Dire Straits sound see this blog post. 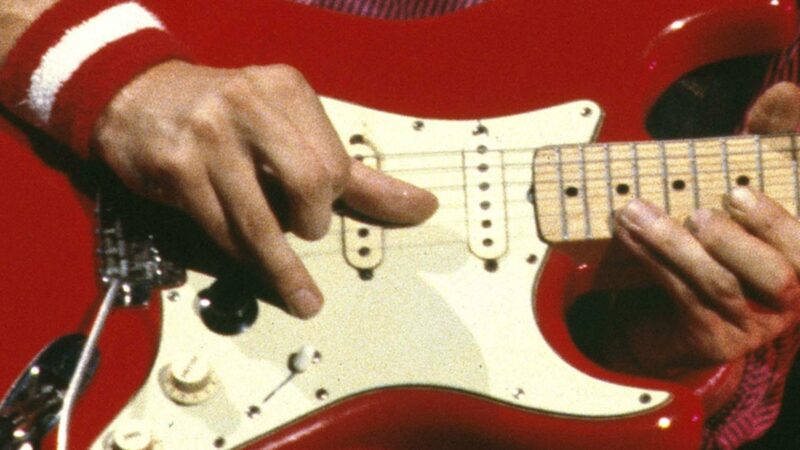 I am sure that Mark had this combo in one of his two red Fender Strats until October 1978 when he moved the DiMarzio to the neck position. You can hear the typical sound on many live bootleg recordings from that time (e.g. Chester 1978, Live at the BBC 1978, live at the Whistle Test, Revolver TV, or Barbarellas/Birmingham). However, he probably had two ‘normal’ pickups in his other Strat which makes it difficult to tell exactly if something we hear e.g. on album one is this combination or not. The FS-1 is a hot pickup, with a DC of about 13 kOhms. When it is played together with a normal 6k-pickup, the resulting sound has more midrange but still clear treble, and is less ‘quacky’ than the middle & bridge combo normally is. Another nice feature: hum is reduced as the FS-1 has the opposite magnet polarity compared to a 60ies Fender pickup. The guitar in the following video is ‘nothing special’ – a Part-o-caster with mainly Japanese Squier parts. I recorded directly into the mixing desk, and added an amp simulation plus some basic effects (reverb, some very subtle delay, and a limiter) in the recording software. I recorded two versions of ‘Down to the Waterline’ (a song where I was wondering if it is with the FS-1 or not… ): one with the tone pot fully up, and another one where it is rolled back to about 7. Maybe I should use an amp to add that slight distortion, and spend more time with a/b comparing to find the ideal EQ and effects settings, this time it was just a quick shot. That could very well be the secret, but I can’t tell yet. I’m so used to what I “think” the in-between sound is that I would have to listen to the record again and do a comparison to confirm. I feel like there was more “quack” on the recording of Sultans than what I hear on this recording, but it could be the absence of the amplifier, compressor, chorus, and so forth. Really cool experiment! Thanks, Ingo! I have an idea, to try and get 3 tapped pickups (namely the mk-guitar VFS-1’s) in a standard Fender Stratocaster,of course the neck and bridge would easily work with push/pull potis on the two tone knobs. However to get a selector for the tapping on the middle pickup, is there any way without including an internal or external switch, such as a push/pull poti on the volume, but i fear this will cause only volume control on the middle and not the selected pickup at the time. I was wondering if you had any thoughts on this. The switch on a push/pull pot is not dependent of the pot in any way. In other words, you can use it to switch whatever you want, without interfering with what the pot controls. So yes, you can easily use three push/pull pots to switch the three taps of three VFS-1/F500T pickups. It does not matter which push/pull is used for which of the three pickups. That does help very much, Danke Schon. however i don’t mind if i lose the option to have all three pickups on at the same time, as I am trying to make a slightly upgraded version of marks Red Fender used at Rockpalast. The upgrade being your pickups. Pretty much like the guitar in the video above just with the coil tapping. Thanks again, habe eine Gluckliches neues jahr.